Mia Kine, under jockey Eagar Ramirez, winning the second of 12 trials at Remington Park on Saturday night for the $1,083,420 Heritage Place Futurity. OKLAHOMA CITY, OK�MAY 14, 2016�The second set of 12 trials for the Grade 1, $1,083,420 Heritage Place Futurity took place Saturday night at Remington Park. 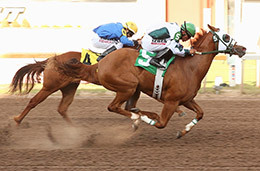 Royal Vista Ranches' DOMINYUN sired one qualifier to the Oklahoma's richest race. Picking up her second win in as many starts, Mia Kine defeated Windows Devil by a neck in trial 2 Saturday night to post the second fastest time of :17.503 seconds. Racing for owner Denis Winn, the daughter of DOMINYUN is conditioned by trainer Rolando Almanza. Eagar Ramirez was aboard the sorrel filly that won a trial to the Sam Houston Futurity(G2) in her career debut on April 2nd. From the Grade 2 winning Special Leader mare Mia Jones, Mia Kine is a half-sister to stakes-placed Awise Hero. Winn purchased Mia Kine from her breeders Vaughn and Jill Cook for $11,000 at the Heritage Place September Yearling Sale. Royal Vista Ranches' IVORY JAMES is the broodmare sire of qualifier Duponte. Already a Grade 3 winner, Duponte finished second to B Double U in the first trial and survived on the "bubble" from race five through 12 to end the night with the fifth fastest time of :17.577 seconds. Purchased by Kristen Paredes for $6,700 in the TQHA Yearling Sale, Duponte is the first foal from the IVORY JAMES mare Havanah Goodtime. After finishing fifth in his career debut, he returned to win the $267,700 Grade 3 Harrah's Entertainment Futurity at Louisiana Downs in his last start March 23. Bred by Bobby D. Cox, the son of champion American Runaway has earned $123,483 in three starts. This is the family of champion Brimmerton and Grade 2 winner Gone Celebrating. The 12 trials on Saturday night were conducted with consistent weather. The program experienced a light 11mph tailwind early in the night that eventually calmed to almost no wind at all. For the complete list of finalists to the Heritage Place Futurity from both trial nights, with their times, sires, dams, owners, breeders, trainers and jockeys CLICK HERE.